July Newsletter! Fun and Fantastic Sales! Hooray for FREE Red, White or Blue Hair Stripes! Make this a 4th of July to remember with a great new haircut, and a little patriotic hair flare to go with it! Because right now at Shear Madness Haircuts for Kids, you can get red, white or blue hair stripes in your hair - FREE with any haircut the week of July 4th (at participating locations)! Just imagine how awesome you'll look at your local fireworks show or family picnic! Yay! It's our Semi-Annual Bow Out Sale! We're having our semi-annual Bow Out Sale on all Bowdacious Bows (at participating locations)! Stop by your local Shear Madness and check out our awesome variety in hairbows and bow-related accessories! We not only have an AMAZING selection of Infant bows, huge bows, festive bows for holidays and much more - but we also have a wide variety of colors! DIY Nail Stations - FREE on July 4th! If you're looking for a memorable July 4th activity to do with your kids, come out to your local Shear Madness Haircuts for Kids and check out our DIY Nail Stations set up in celebration of Independence Day! Paint those digits red, white and blue! This awesome event will take place all day on Monday, July 4th (at participating locations), so be sure to get it on your calendar! 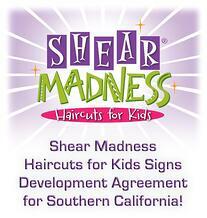 Shear Madness is coming to California! First Opening Expected in Orange County this Fall! Shear Madness Franchising, LLC of Overland Park, Kansas recently announced the signing of an Area Development Agreement covering 5 counties in Southern California! You can learn more about this exciting news by clicking here! Also, if you're interested in learning more about running a business, or franchise opportunities with Shear Madness Haircuts for Kids, check out our Franchise Toolkit to get started! 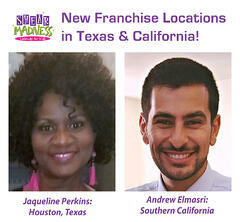 Plus, if you're interested in our other free resources for businesses, or would like to learn more about how to become a successful owner of your own franchise business, check out our blog or call 1-888-98 GONE MAD! Staying Cool & Having FUN! Around-the-Clock FUN on Social Media! It doesn't matter if you're a morning person or a night owl, because we're always rockin' around the clock on our social media pages! You're sure to find something to smile about with our funny jokes, customer feedback, great sales, our monthly newsletter and more - and it's all happening right now at our Shear Madness Facebook page! Plus, be sure to check out our constantly updated Franchise Blog, Instagram, Google+, Twitter and Pinterest! Get more "Bang" for your Buck with OUR Coupons! Do you love to save money or find a great deal? If so, you're sure to have a blast with the great offers available on our coupon page! Because whether it's shopping for a July 4th get together, birthday party, or other special occasion - you're sure to find that jaw-dropping deal you’ve been waiting for at Shear Madness Haircuts for Kids! These Crafts for Kids are AMAZING! Make Something AWESOME! Whether you're planning fun kids crafts and activities for a family gathering, or you're just looking for something exciting to do with your kids this summer, Shear Madness Haircuts for Kids has just the thing on our Crafts for Kids section on Pinterest! Learn how to create DIY paper stars for the 4th of July, a shiny kid-safe sparkler craft, moon rocks, cereal self-portraits, watermelon sun-catchers, pipe cleaner finger puppets, a firecracker popcorn recipe, an ocean "slime" recipe, "fireworks" in a jar of water, colorful paper popsickles and MUCH more! Have fun!